25 years ago, a campaign started to get McDonald’s to replace its use of Styrofoam. In 1990, McDonald’s said they would phase it out but that only happened with burger boxes. Now they actually are testing paper cups in thousands of stores, following a shareholder resolution. These cups don’t quickly degrade, fill up landfill and end up in places like the great Pacific garbage patch. The chemicals and waste used to produce them pollute and laching from them may effect health. “Given the company’s history of using high levels of recycled content in other food packaging, we hope that it follows suit with its cups and also establishes a robust recycling program for post-consumer waste left in its restaurants,” he said in a statement. MacKerron’s group introduced a shareholder proposal last summer, asking McDonald’s to consider alternatives to polystyrene. Last year, the Republicans in Congress fought a battle to get Styrofoam cups back in their cafeteria as part of the fight against the liberty-removing House composting program. Do styrofoam cups make your coffee taste as bitter as Richa B. is? I can't believe that in America you STILL use styrofoam!! When ARE you going to understand the aspect that we are polluting our planet not to mention the health problems you are creating for yourselves. 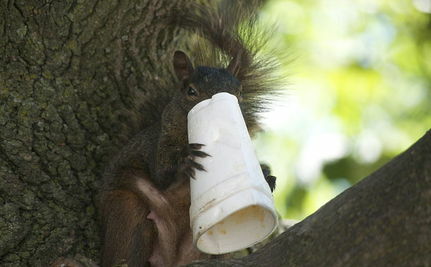 Styrofoam contains high levels of BPA's. This is probably where the horrible taste comes from.